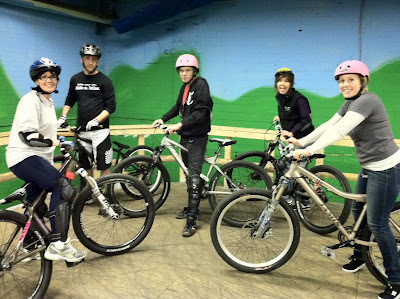 Last Friday, January 27, the gang from Century Cycles hosted a get-together at Ray's MTB Indoor Park in Cleveland -- our second-ever CC Night at Ray's! Among the store staff in attendance were Justin, Rich, Rob, Ed, Kyle, Lynne, plus a few spouses and friends! Since there were several beginners in the group, they started riding in the Beginner Section, practicing staying in between the painted lines. Once everyone felt familiar with their bikes, they moved to the Yellow Room, where they practiced skinnies, berms, and rolling over box jumps. Next, they headed over to the Sport Section and rode the Rythym Course, then moved on to the pump track. Those who visited with in the Black Box Room were treated to CC stickers and tatoos, plus one lucky man and woman each won a Century Cycles t-shirt! Justin put together the video and photos below, featuring his wife Kristen and some of our other guests working their way up from the Beginner Section to the more advanced areas. Click here if the slide show and/or video above are not appearing for you.